Graduates of Samford University’s McWhorter School of Pharmacy were encouraged to find contentment in both their personal and professional lives during commencement ceremonies May 6. Drawing from a commencement speech his late father made at Samford in 1989, Stuart C. McWhorter told the 215 graduates that the most accurate measure of success is happiness. McWhorter is CEO of the Nashville (Tennessee) Entrepreneur Center. McWhorter recalled his father’s extensive career in health-care administration but said his “best days” began when they formed a venture capital firm in 1996. 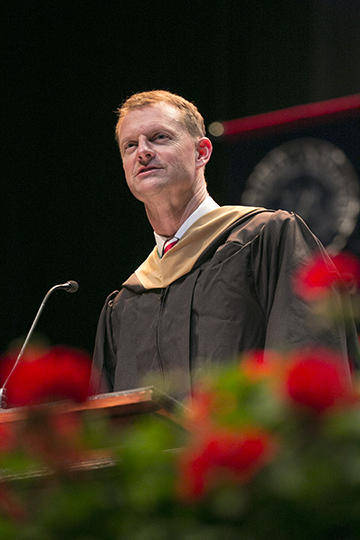 McWhorter gave the graduates four principles that he said were important to his father throughout his life and career: carefully select your role models; be prepared; think and act like an owner; and give back to others. “My father spoke often of his many mentors along life’s journey and credited each one for his success, knowing that it would not have occurred without their interest in him and support of him,” McWhorter said. He also encouraged the graduates to “act like an owner, no matter what position you hold in the company or with your employer. McWhorter also told graduates that they have “some level of responsibility” to give something back to family, university and community. Degrees were awarded to 109 Doctor of Pharmacy candidates and 106 Bachelor of Science in pharmacy graduates. The ceremony was the first of seven scheduled at Samford over the next week.